Let's take it easy and have a little fun, shall we? I think it's always fun when sprinkles are involved. It just brings out the kid in me and makes me smile. No shocker, I grew up loving ice cream. It's still one of my favorite things on earth. And sprinkles - of course, I loved sprinkles on my ice cream (I'm particularly partial to nonpareils) but I'd never had sprinkles in my ice cream - or in my cake or cupcake, for that matter - growing up. The whole world of confetti, funfetti, or birthday cake flavored ice cream and baked goods is a relatively new phenomenon to me but it's something kids like my son are very familiar with. The kids love it and who can blame them! This is actually my first foray into the world of funfetti, and maybe there's no going back now. It's just too much fun. It all started the other day with a small batch recipe of butter cookies from Dessert for Two. It doesn't need to be Christmas for us to make butter cookies, right? I wanted to make a small treat for my son and a handful of butter cookies sounded like just the thing. But instead of just making a handful of funfetti butter cookies, I split that small recipe up even further and made half with sprinkles and the other half with mini chocolate chips. Old habits (i.e., adding chocolate to everything) die hard. 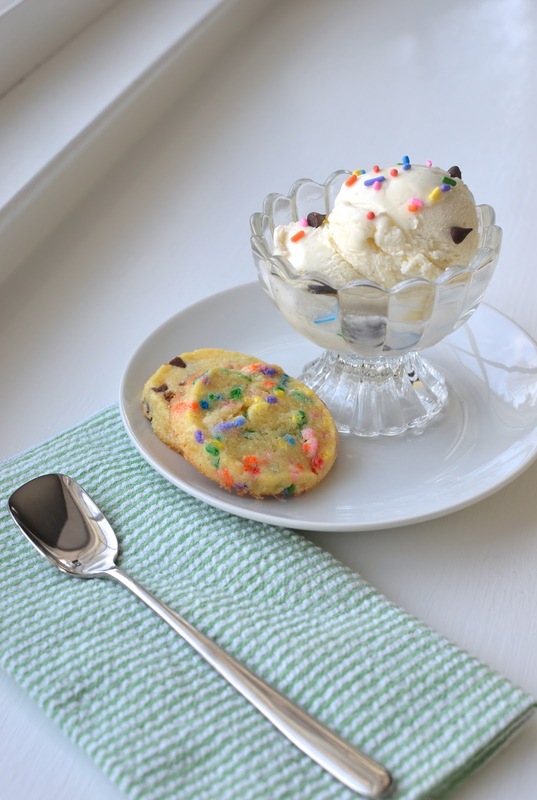 In my twisted mind, I feel some reluctance - something like guilt - at the idea of stirring sprinkles into cookies. Yet I have no such qualms about chocolate. I also thought it would be fun to have options and frankly, chocolate chips are a safe bet. You could use this recipe to make 6 thicker cookies or divide it into 8 cookies like I did. I ended up with a nice little batch of butter cookies. I shouldn't have been surprised that my little one liked the sprinkle-laden ones best (though he had no problems devouring the chocolate ones either). I agree they are fun to look at but my husband and I went for the chocolate chip ones first. My son had a week of statewide testing at school last week. Aside from making sure he got a good night sleep and a healthy breakfast in the morning, I wanted a treat for him after school. I think of it as something like the 'work hard, play hard' philosophy; eat well most of the time and enjoy treats as well. These butter cookies with ice cream were one of the treats and they certainly did bring a big smile to his face as he told me about his day. I think my love for small batch recipes is pretty well established by now so it's no surprise I'm a big fan of this one. To make the 2 kinds of cookies, I just divided the butter cookie dough into two bowls and stirred sprinkles into one, and mini chocolate chips into the other. I was reminded of a few things making these butter cookies. Mainly, make sure the sliced cookie dough goes into the hot, preheated oven nice and cold. I chilled my dough but took a little too much time with the pictures so that were sitting out for a bit (it's gotten a lot warmer in the last week) and the cookies spread a bit while baking. It's also good to avoid beating the dough too much - that can also cause spreading. Luckily, the situation wasn't too bad and after they came out of the oven, I took a round biscuit cutter and cut off some of the thinner edges that spread out during baking. I was glad things worked out and I had these cookies as an after school snack. These nibbles were a fun little treat - buttery, a little flaky and crisp at the edges, and tender inside. A simple yet tasty treat that kids (and adults) will easily and readily enjoy. In the bowl of a stand mixer (or using a hand mixer), beat the butter and sugar on medium-speed until combined. Avoid over-mixing to prevent cookies from spreading too much. Beat in egg yolk and vanilla, then add flour and salt, beating together until just combined. To make the two variety of cookies, divide the dough (it will still be a bit crumbly) evenly into two small bowls. Stir sprinkles into one; stir chocolate chips into the other. (To make just one variety, simply stir in the mix-in of your choice). Shape the dough into a small log, each about 2 inches long (you will have a 4-inch log if just making one variety). Wrap logs in plastic wrap and refrigerate for at least 1 hour or freeze for 30 minutes. Preheat oven to 375 degrees. Line a baking sheet with parchment paper or silicon baking mat. Slice each mini log into 4 cookies for a total of 8 cookies (or 3 thicker cookies from each log for a total of 6 cookies, if you prefer). Work quickly to make sure the cookie dough stays cold before going into the oven to prevent spreading. Bake until edges of cookies begin to brown, about 10 minutes. Let cookies cool on baking sheet for 5 minutes before transferring to a wire rack to cool completely. I adore slice and bake cookies, and I love the idea of splitting the dough for variety --- pinning! Butter cookies and sugar cookies are the classics that surprise you when you haven't had them for a while. You can't go wrong with some good butter cookies. Hope all is well - thanks for stopping by! These are just too cute, and I was impressed with your perfect circles...until I read your biscuit cutter trick ;) Still beautiful though. Hmmm.....I'd probably go for the choc chip ones too. You could totally do it too since it's so quick! Thanks! I love melt-in-mouth butter cookies. These look so adorable and chocolate one will be my favourite. Gotta have "cute" sometimes! : ) Chocolate ones for most of us grown-ups and we'll save the sprinkles to admire and let the kids devour. Hi Monica, these cookies are adorable and just make you smile. I be they are delicious! It was fun, thanks Cheri! I just made chocolate chip cookies yesterday and froze a handful. Need to do the same with log cookies. Thanks, Julia. Sprinkles in EVERYTHING!! Okay, not EVERYTHING...but definitely in cookies. These are so fun! Your cookies are so pretty! And I absolutely have to get that cookbook. It sounds perfect for me. The book is great! Have a great weekend, Beth. I am the same way. I just made chocolate chip this week and thinking about why I don't make and stow away slice & bake ones. I think my mind naturally think to warm, gooey, chewy type cookies but butter/sugar cookies always surprise you and remind you how good they are when you do have one. Sooo fun and adorable! I love these :D Welcome to the world of funfetti! It was really easy and fun...thanks, Aimee! I think slice-and-bake cookies are wonderful! Change up the basic dough with add-ins (I love your Funfetti!) and you have a bunch of different cookies! Plus, frozen rolls of dough are perfect for slicing off just what you need, when company arrives or a craving hits! Standardized tests can be exhausting to kids and they mess up everyone's schedules. These cheerful little cookies must have been a perfect testing week snack! Your son is so lucky to have a baking mom, Monica! These look amazing and I love small batch cookies too! Bake them whenever the craving hits! Nothing like home made cookies! So yummy! So true...homemade wins by sheer freshness and aroma. Thanks, Asmita.